The portrait miniature was conceived as a pocket size memento, a love token or propaganda. Roman and Grecian miniature portraits on jewellery for example were often expressions of love and fidelity. In the dark ages, the depiction of a ruler on the head of a coin was an overt and dramatic image for propaganda purposes. During the Italian renaissance as the ruling dynasties of the Italian courts grew, their portraits were made in miniature and circulated to gain favour and control. In 16th and 17th century Europe miniatures began to appear on vellum and within manuscripts and in the 18th century period of Enlightenment, the newly empowered celebrated their own identities launching the heyday of the miniature portrait. 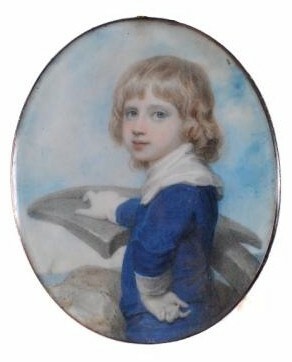 A miniature of a boy, circa 1788, by Richard Cosway, which sold for £16,500 (FS9/360). The early notable miniature portrait painters include 17th century artists like Nicholas Hilliard, Nathaniel Hone and Samuel Cooper and in the 18th Century the small but growing list of miniaturists is lead by painters like George Engleheart, Andrew and Nathaniel Plimer, Richard Cosway, Samuel Shelley, Richard Crosse and the enamel specialist Henry Bone who was born in Truro in 1755. One of the most beautiful miniatures we have seen is this exquisite portrait of a boy in midshipman's uniform by Richard Cosway (1742-1821). Cosway was a Devonian, born in Bampton, and latterly completing commissions for the Courtenay Family at Powerderham and altarpieces for Tiverton and Bampton. At the age of 12, Cosway was sent London to study under Thomas Hudson at Shipley's Drawing School. Daphne Foskett says in The Dictionary of British Miniature Painters that Cosway was "an eccentric, foppish in his attire, small in stature, superstitious and inclined to mysticism". Nevertheless, he became a personal friend and the Miniature Painter to the Prince of Wales, until 1811, when the Prince Regent became "more selective of his immediate circle" and Cosway was dropped!